Is today’s Church paralyzed by clerical interference or by a lack of vocations? Is the Church afflicted from priests who abuse their sacerdotal ministry of teaching, ruling and saving souls or of the lack thereof? These are crucial issues to which the average Catholic cannot be indifferent . . .
Interview with Fr. le Roux, SSPX, the rector of St. Thomas Aquinas Seminary, Winona, MN. “Introibo ad altare Dei…” A priestly anniversary. The history and ceremonies of the rite of ordination. The Divine Office is like the consoling companion of the religious soul traveling through this valley of tears. 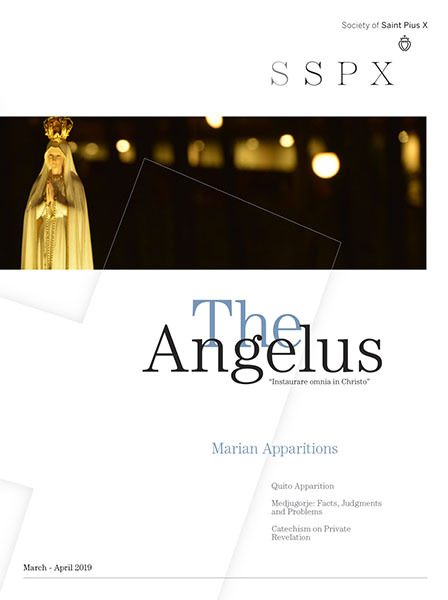 Angelus Press interviewed several priests, Fathers du Chalard, Emily, Groche, as well as H.E. Bishop Bernard Fellay, who were close associates of Archbishop Lefebvre from the first pioneering years of Ecône. St. Pius X, extracts of his Exhortation to the Clergy, Haerent Animo. Bishop Tissier de Mallerais writes about Archbishop Lefebvre, his life, his person, his work, and his doctrine. Far from remaining an issue only for the Middle Ages, lay investiture [the appointment of Church officials by lay rulers], as part of the whole question of the proper relationship between Church and State, still exists today. How a parent should respond to a child considering a vocation. How to have a healthy and relaxing summer vacation. Interview with Fr Couture (former district superior of Asia) about the history of the SSPX apostolate in Asia. Is there a hierarchy in the Church? Why is the Church’s hierarchy connected with the Sacrament of Holy Orders? Orders are not an impediment to matrimony in the Eastern Church. Hence, should not Latin priests also be allowed to marry? Why did the Roman Catholic Church experience a sexual abuse crisis? Archbishop Cupich of Chicago, not long ago, spoke of the need for priests to focus on their baptismal vows rather than on their ordinations. Is this what we mean by clericalism? Reflections of Fr. Roger-Thomas Calmel, O.P. († 1975), who was perhaps the first theologian to condemn the modern trends in France, with Bishop Tissier’s commentaries. What was Jesus thinking when He said: “Do this in remembrance of Me”?